Creative culinary competition. The banquet is finally here. A series of disasters sets one chef well behind schedule so it is all hands on deck. The banquet is finally here. It's the culmination of months of hard work as the winning chefs strive to plate up perfect dishes for the ladies of the Women's Institute, at London's historic Draper's Hall where pioneers of the WI once gathered. To help them prepare for the big day, WI calendar girl and long-serving member Angela Baker is on hand to welcome the chefs and show them their kitchen. She has a surprise in the form of three mystery sous chefs. The following morning, with just hours before the guests arrive, a series of disasters sets one chef well behind schedule, but with all hands on deck and to the sounds of the WI anthem Jerusalem, the Centenary Banquet gets underway. 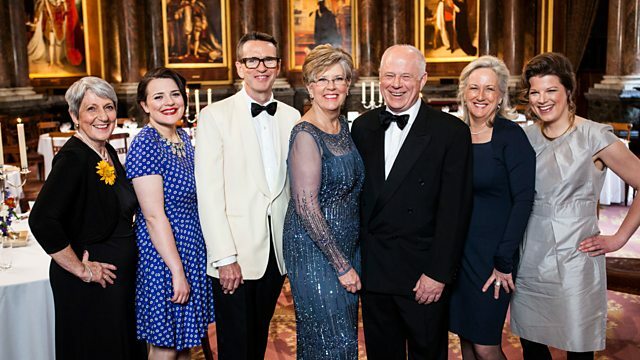 The chefs must plate up absolutely impeccable dishes, as dining today are not only judges Oliver Peyton, Prue Leith and Matthew Fort, but the ladies of the WI, including Janice Langely, current chair of the Institute, as well as their mothers, wives, girlfriends and sisters.